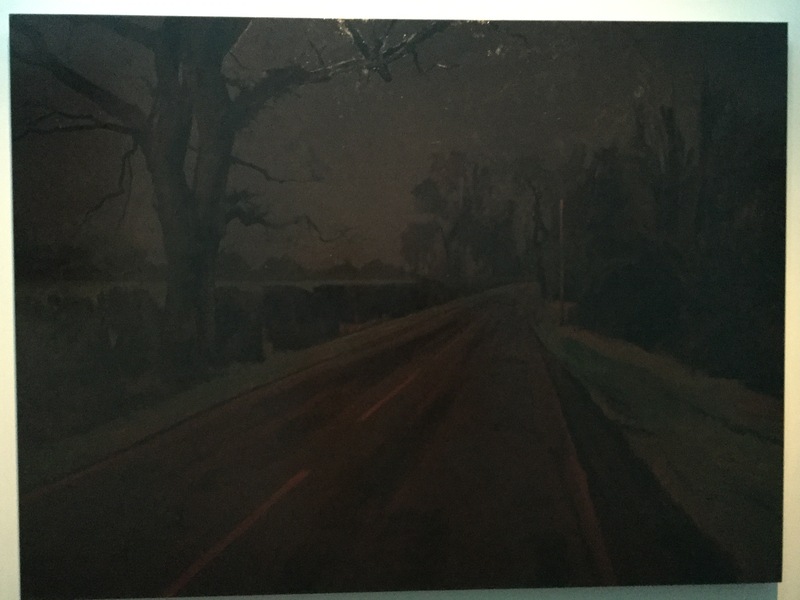 Although nominated for the Turner Prize in 2011, I was not familiar with artist George Shaw’s work until I happened by his Study for the Painter on the Road 1 as part of the current Melancholia:After Sebald exhibition at the King’s College corridor at Somerset House. I was immediately arrested by the chord of light inherent in the frame, a pensive suffuse of red-ochre that queasily referenced dried blood, suggesting the presence of apocalypse-it’s less the colour of any known reality than the emotional tenor of unease or discord. 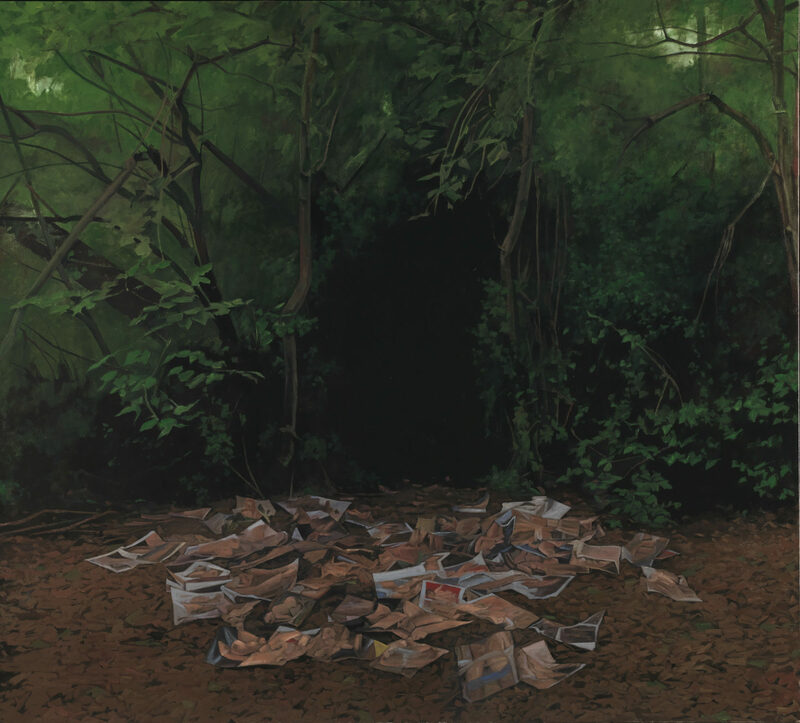 It transforms an otherwise ordinary scene of an idyllic rural lane into a locus of troubling and cryptic menace. 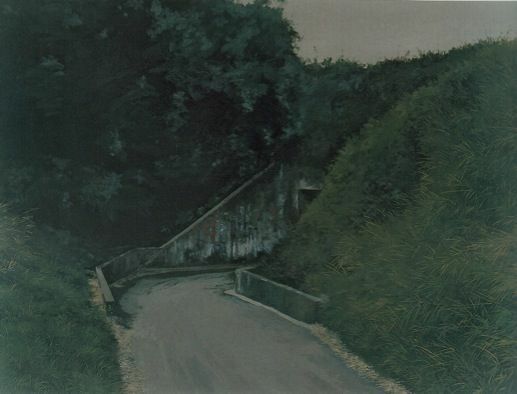 The charged bend in the road, an inexorably approaching void, promises a Stygian threat-in every crevice is the stir of abandonment and oblivion. 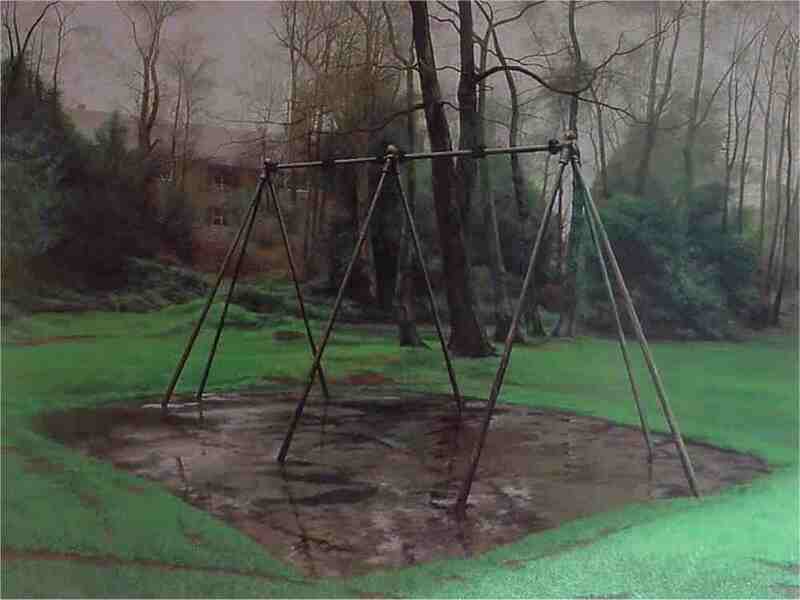 Shaw almost exclusively uses Humbrol enamel on MDF boards, which gives his paintings a hallucinatorily photorealistic quality, and he has for years used as his subject the environs of the Till Hill estate in Coventry, his place of birth and where he spent much of his youth. Entirely absent of any human presence, the eerie images foreground waste, mess, rust, desertion-the vacant is extolled. The imagery brings to mind Gregory Crewdson’s staged photographic tableaux of suburban spiritual anomie and quiet despair , although Shaw references a wide range of artists from all throughout history in his choice of palette and perspective, and remains more disturbing for being much less theatrical than Crewdson. I haven’t been able to shake this picture from my mind, although neither the shot I took of it nor any image online can with any authority reproduce the complexity or depth of its physical bearing.